Liskow & Lewis lawyer Kelly Scalise served as Chair of the Admiralty Law Section of the Federal Bar Association from 2015-2017. 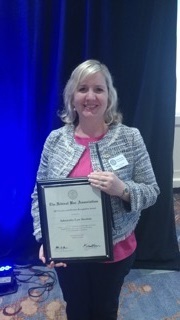 On Saturday, The Admiralty Law Section, which Kelly co-founded, received a Section/Division Recognition Award at the Federal Bar Association's Annual Meeting held in Atlanta, Georgia. As Chair of the Admiralty Law Section, Kelly was honored to collaborate with other dedicated maritime professionals from across the nation. The Section provided insight into the everyday challenges of her maritime colleagues, and as the outgoing chair, her commitment to the Industry has never been stronger.